Here at House of Cards it's the end of the term. We are saying a fond farewell to some of our DT members and feel so grateful to those staying on. To say goodbye and thank you, we're celebrating with a blog hop! You should have arrived here from Judy's blog. 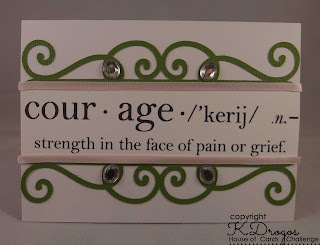 This is a definition stamp and for me I saw it at the right time. I have 2 wonderful friends in my life who are going through some tough times. And this sentiment is perfect for a card for each of my friends. Here's how I used it. These swirls are from the Silhouette store. I used ribbon to outline the sentiment and some bling. I love pink and green together! In this photo there you can see the sparkle a little better. The frame inspired this card. 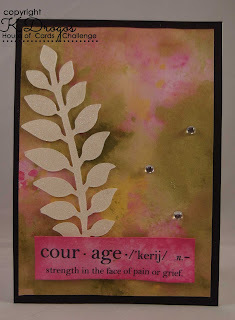 I used a Tim Holtz embossing folder. 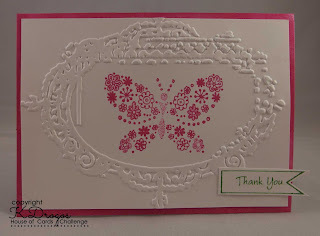 For the pink butterfly I used Picked Raspberry distress ink. I also used it around the base of my card. The Thank You is from the tags stamp and I used mowed lawn for that. I always need Thank you cards so this was perfect! So, are you ready to get hopping?! Yep, it's time, but first we've got some fabulous sponsors to share with you! Make sure you leave a comment at each person's blog along the way because the prizes are hidden and we'll be doing random drawings from the blogs where they are hiding! :) After you're done, make a creation to share with us here, too, for another chance to win! The name says it all! 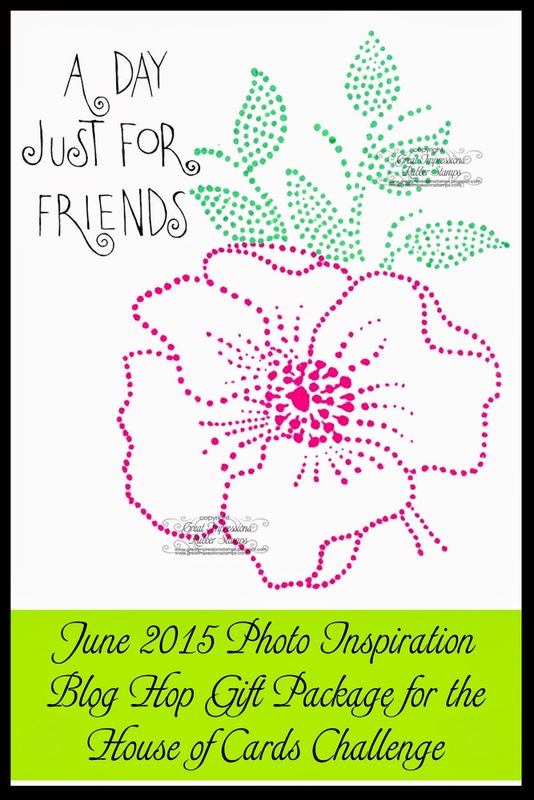 If you're looking for wholesome digital "stamps" and papers that will make you smile, this is the place to shop! We have a variety of sets for any occasion and any crafter. Stop by to check them out today! Eclectic Anthology is your source for commercial use, royalty free, printable antique and vintage digital graphics. Much of what you'll see is exclusive to our site and can't be found anywhere else, but we also have some public domain graphics as well. Everything has been professionally edited and retouched for maximum quality and expert clarity. Great Impressions was founded in 1984 by Ken and Deone Mackenzie. 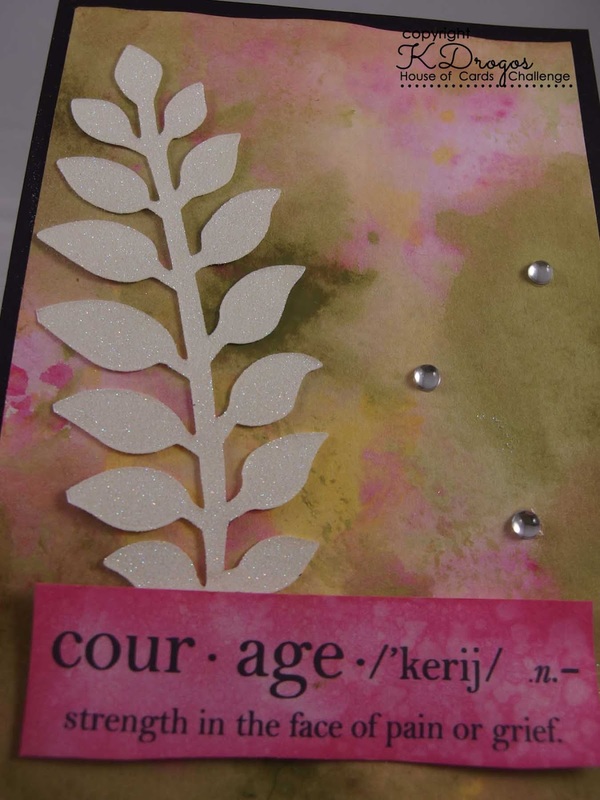 With a love for stamping, the company grew. The result is a quality rubber stamp in either wood mount or stickable mount backing for all your stamping needs. Great Impressions' goal is to provide the highest quality stamps and to inspire creativity! Please check out our online store to see over 1,000 stamp designs today! 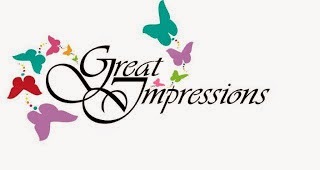 We know you'll find something that will leave a "Great Impression" on you! We are proud to say that we have been in business, serving our customers since 2010. We have a very large and talented group of Digital Creators who sell their products in our store and who regularly upload new products. You will find something new almost daily. Now get to hoppin'! Your next stop is Lilian ! Don't forget to link up a project with us after completing the hop for an extra chance to win a mystery prize from one of our fabulous sponsors, too! So gorgeous!! LOVING the colors!!!!!!! That sentiment is just wonderful - you'll make your friends very happy with those cards! Katy, your cards are so cute! I love how you were inspired by he little details too! Wow, girl, you went all out--love your cards! Nice that you showed how the sentiment can be used in such different ways. And I'm glad you used the GI flowery butterfly stamp which I just ordered. So cute! wow, you've been busy! three beautiful cards, each one so unique and i'm sure they will be appreciated. Gorgeous cards Katy! I love the different way you've used the sentiment! I'm sure your friends will love them! Gorgeous cards Katy! Super sentiment you picked! Have a great day! Oh, they are all lovely... Thank you for sharing. Love that sentiment. 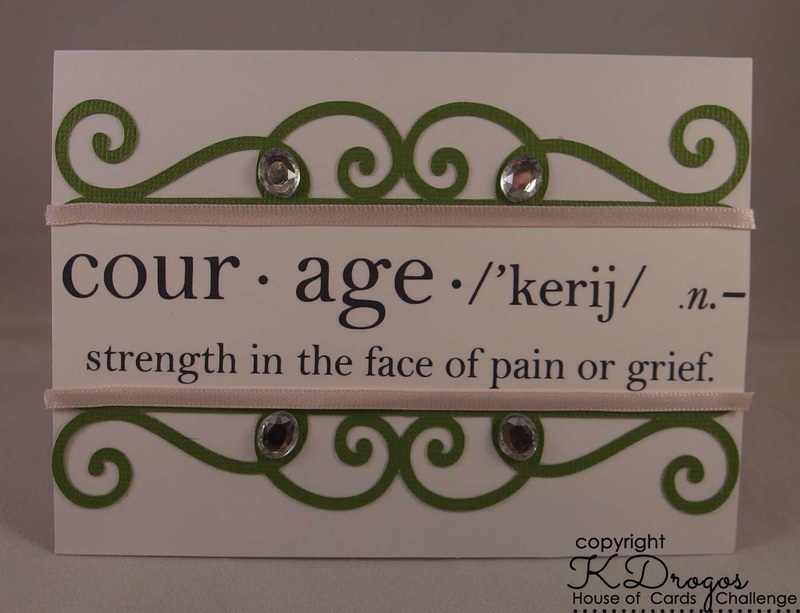 I will need to purchase that because I have 2 friends that have just found out they have cancer so this would be perfect to use in a card for them. Gorgeous cards! My fav is the middle card ... that background just rocks! 3 pretty cards Katy! I really like the embossing on the third one! Interesting cards, I like the both card with the beautiful background. Hi Katy. All your cards are great. Wonderful cards. You have been busy lol! 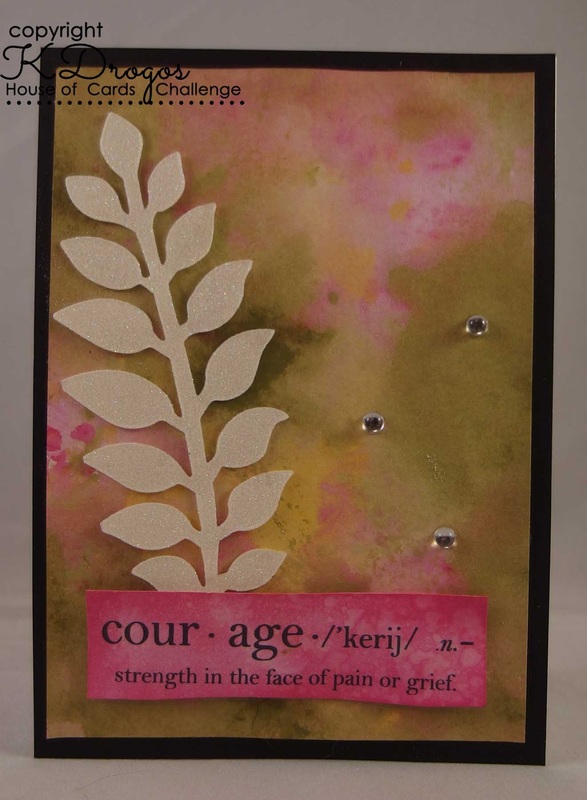 Don't you just love working with distress inks? Stunning card and I have really enjoyed being on the team with you. Gorgeous cards, Katy! 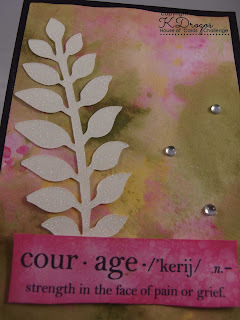 Especially love the one with the leaves and the courage sentiment - fabulous colors!! All of your cards are beautiful! My favourite is the second one -o love your background! Wonderful interpretation of the inspiration graphic! Thank you for the fun blog hop! Each card is so different and yet the same! Clever girl, I love them all! Hi Katy - these are 3 very different cards and I like them all, although your first CAS one is my favourite! Thanks for sharing! Lovely set of cards. Beautiful. Three lovely cards Katy - love that pink and green background.